This is one of the few places where you can get traditional Tamil Nadu food. More specifically, where you can get Tamil-style sambhar! A little restaurant in Indiranagar, The Chennai Express keeps it simple with steel tables and plastic chairs – almost a darshini, but not quite. 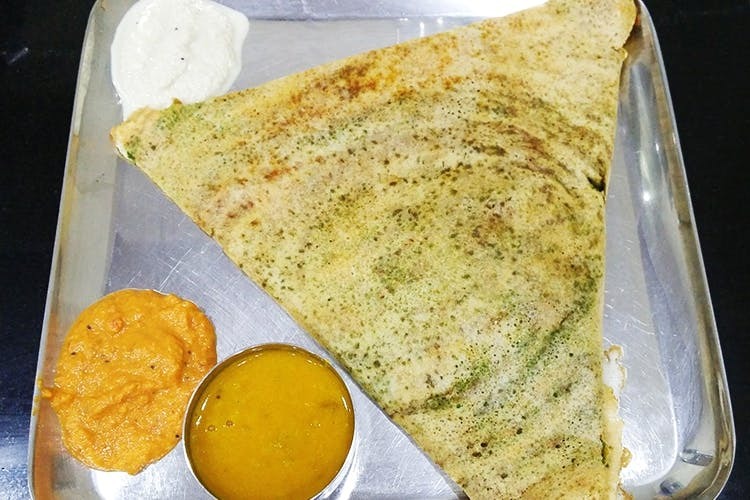 They serve authentic Tamil Nadu food – ranging from dosas and meals to idiyappams and lemon rice. Since they’re open from 7am to 11pm, you can drop in for meal times, or in between if you’re feeling peckish. Of course, you’re welcome to go for breakfast and not leave until after dinner. Folks who want an authentic taste of Tamil Nadu must put this on their priority list. And anyone hungry and living life on a budget! Went there for a weekday breakfast around 9am and the joint was half full. The service is very quick and the place really clean. It is only place until now, where I have had good old Tamil Nadu-style sambhar which is not sweet like the Karnataka one. Their idlis are amazing. Their dosas are also really tasty but they could be thicker. Oh, and they serve you very little chutney, but feel free to ask for more. Get down at the metro station and walk down to this place.